Like many style bloggers, I'm a huge fan of scarves because they can be such a powerful, outfit-making accessory. Unfortunately, scarf season is nearly non-existent in LA--seriously, blink and you'll miss it! So today I am introducing the non-functional scarf accessory. This skinny lace scarf is simply too dinky to provide any warmth; it's purpose is purely decorational. Neck-tie details have been trending the past few seasons, especially when paired with blouses. I see myself wearing this simple one (i.e. instant classic) I got from Forever 21 a lot as it makes a perfect blank canvas to build upon. As for the moto jacket, I'm sure you've seen it before. I first noticed it at Nordstrom last spring but they had trouble keeping it in stock before I could bite the bullet. It's a real suede jacket for less than $200! Now it's back for fall in plenty of colors and I've noticed a lot of other retailers are carrying it too. I ended up getting mine at Bloomingdale's recently when they were having their "private sale" and I'm quite happy with the fit and feel of it. It's seriously a fall must-have, and I'm still considering picking up another color! I'm wearing an XS and it fits perfectly. 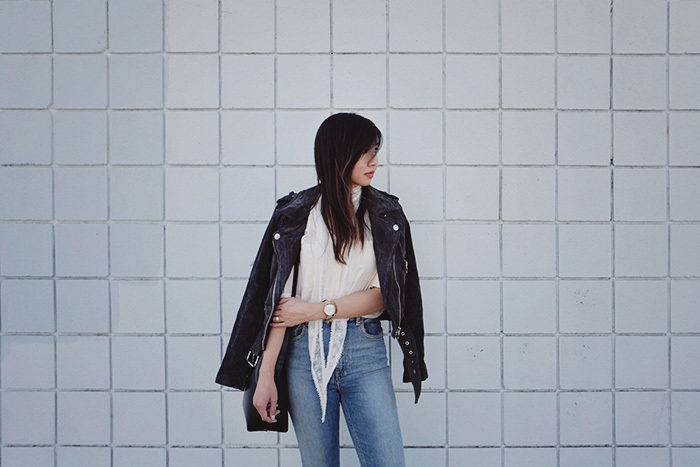 Such a perfect, classic outfit girl, those jeans are fab, you look amazing! I love your jacket, look so chic and edgy. I love the scarf as well and how you styled it! Hope you have a happy weekend ahead! I love this outfit! So effortlessly cool. The scarf really does elevate the whole look. I love this outfit of yours and that scarf accentuate your neckline :) Have a happy weekend! agreed! scarves are outfit-making accessory! I adore this look, very chic! That jacket is my favorite. I also love those sliders, very cute. Great style! Such a cute lace scarf! A must item in your closet in my opinion! Love the outfit you put together! Great jacket. I agree, I almost never wear a scarf in LA. 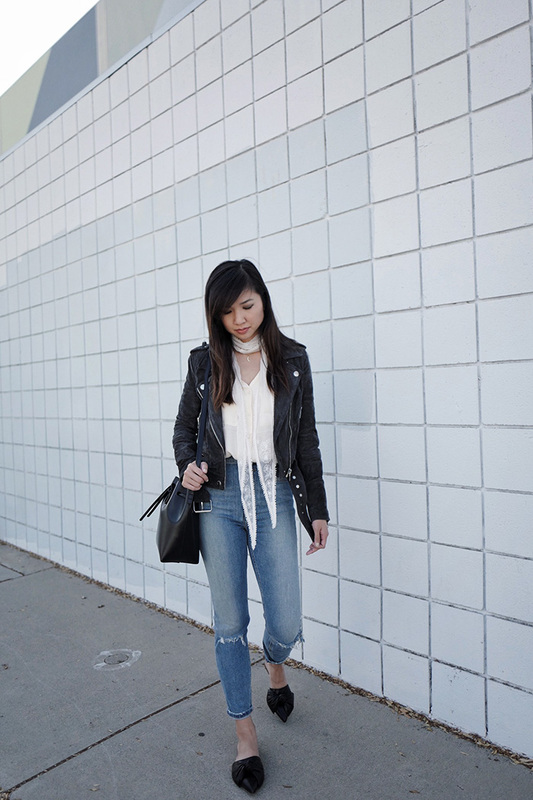 I love outerwear and so I like to jump right into my closet of jackets and costs when it gets cold but a skinny scarf is really nice for styling.i have a couple of small silk handkerchieves I wear around the neck and this is a nice reminder to wear them! This outfit is just grand. 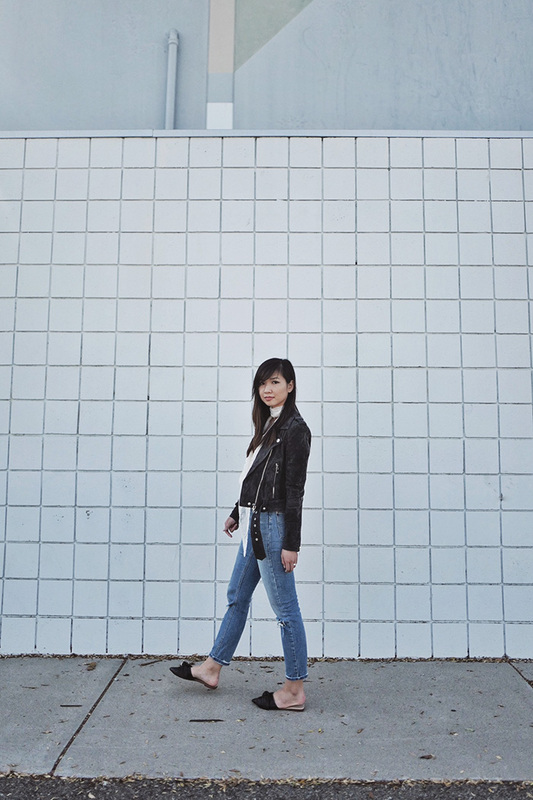 It's a perfect, chic-yet-casual ensemble that totally has me swooning. That scarf is so pretty on you, too - made for an LA fall! I love the beautifully crafted, lace scarf. The detailing is so intricate! 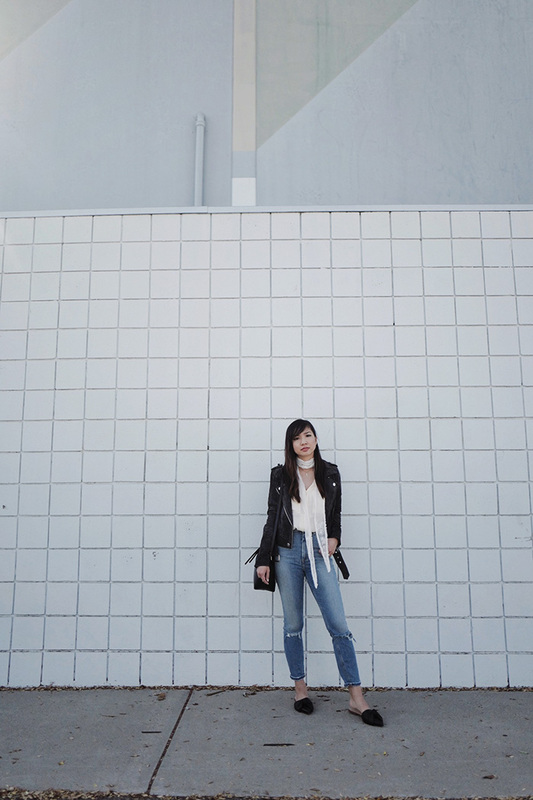 What an amazing casual chic look Tania! I really love scarves too and this one looks like it's part of your blouse! Perfect styling and you look so beautiful! Perfecto is one my faavorite item when fall is coming ! Love yours and the way you accesorized it with a lace white scarf and white blouse. I'm glad that you found a way to accessorize and dress for fall in LA's intense heat. That scarf is very, very cute. I'm also in love with that jacket! It looks very luxe! 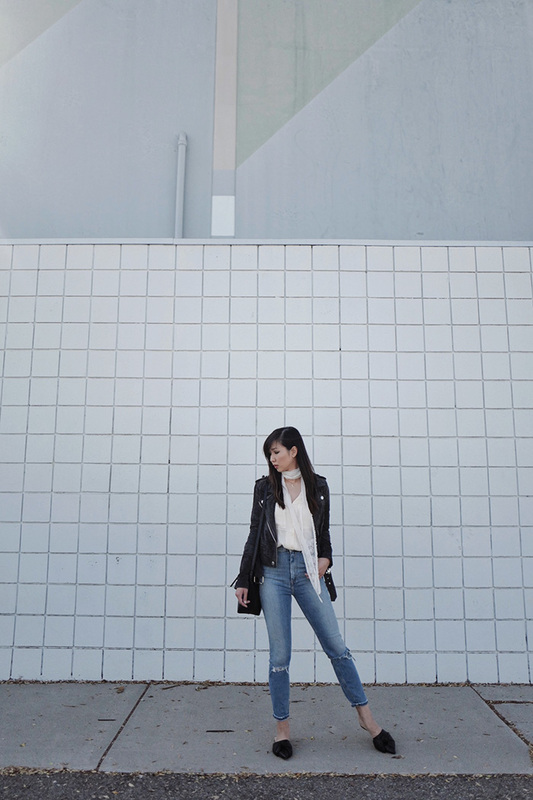 Love the skinny scarf trend too. You pull it off so well!! Thaat's such a bargain for your jacket! Love it! loving that skinny scarf! you look amazing! I love that neutral backdrop since it matches your sweater! So cute! I LOVE this outfit. It's definitely something I would wear! 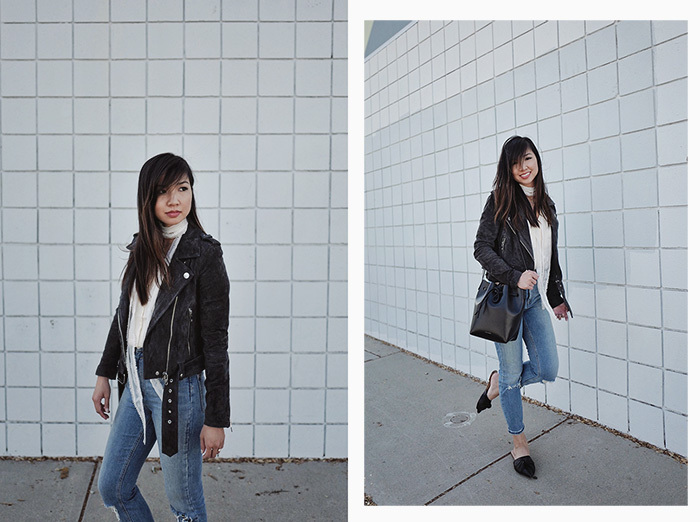 You styled the lace scarf so perfectly -- can't go wrong with a leather jacket! It's so interesting how fashion has evolved so far that we now use certain items that were only functional as fashion accessories. I think a scarf is a lovely statement piece and while it definitely is still quite the functional piece for colder climates, the skinny scarf is a great way to still feel cozy and autumnal without it causing you to overheat in warmer climates! I love scarves! It's also hot (maybe way hotter) where I am, so people always give me stares when I wear them but f- it.